This fragrant, simple dessert is ideal for making ahead of time and storing in the fridge until ready to serve. Place the sugar and vanilla in a food processor and blend until the vanilla pod is finely chopped. 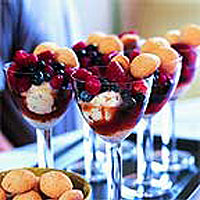 Place the berries in a large bowl, scatter with the vanilla sugar, then pour the wine over. Cover and chill for at least 4 hours, or overnight. Place a ball of ice cream in 6 individual glasses and top with the mulled fruit. Serve with the biscuits on the side. Waitrose Stem Ginger Ice Cream is a well matched partner for this fruity dessert, but a dollop of whipped double cream makes a very good alternative.